I'm writing this retrospective from the air-conditioned comfort of my home in Fort Lauderdale, FL. (I am not worthy.. <g>) This is the first time since the 25th anniversary (i think) that i have been off the ranch during Big Folk, so there's a lot of unknown stuff floating around in my head. Well, more than normal, anyway. Ellen & I got to the ranch on wednesday, 5/22. People were arriving, setting up their camps, our RV was already in it's spot, and our tent space had been staked out during landrush (many, many thanks to Charles Ottenweller and his compadres). In the lower lower meadow, a strange structure was arising from the dust... The debate was on.. Was it going to be called camp WTF ?? or perhaps camp Rebar ?? The entire structure as of early wed afternoon consisted of lots of rebar wired together.. Landrush attendees said that it had taken a number of hours for the structure to go up.. With sharp edges, everyone was guessing how long any top would last before tearing, presuming that a top would, in fact, be added to the mix. On wednesday afternoon, a peaked rebar roof was added to the structure (and the rebar bent appropriately), and duct tape was used at the corners to cover up the sharp edges.. A canvas top was added to the mix, and viola, Camp Guillotine was born.. I'd estimate that there was about 20 man hours in the construction of the entire structure, so forget about the "easy assembly, no tools required" marketing approach.. Of course, when the rains came on Sat night (?) a new plastic tarp roof was quickly(?) added to the mix... This was certainly the most unique new structure in our little corner of the ranch.. While i was rushing around on a mission for most of wed and early thursday, the calming effect of the ranch began to overcome my type "A" personality sometime on thursday. This was a good thing, as, for the first time in many years i was not going to be able to spend the entire festival at the ranch. Ellen & I have lots of house buying and selling and moving things going on in the real world, and, this year, despite wishes to the contrary, it has to take precedence over the festival. It only took 4 trips to town and to storage to get the RV and tent camps set-up for our stay. The bread machines began baking on thursday, just as the bread we had brought with us ran out. We were set-up and ready for the "official" start of the festival at the ballad tree on 3PM. While Jon Michaels was 1 hour late as the host, someone still found a hat, and some paper, and names were being pulled out and singers were singing. One of the first things i noticed was half of the ballad tree oak was gone. The "live oak decline" disease has apparently hit the ranch. A significant number of the oaks had been cut way back and much of the wonderful canopy that had grown over the decades was missing. Every year at kerrville is different.. All wonderful, but all different at the same time.. People are in different places, different spaces, different heads, and some are in different bodies, (or WITH different bodies <gg>).. This year, for the first time, i've got a distinct interest in New Folk. It's not just a friend or acquaintance, it's my partner, ellen bukstel who is one of the finalists.. there's much energy being directed to the competition, as opposed to other years, where i was "just" a very interested observer. As joyful as it is to discover and walk down new paths with someone new in your life, it's painful to leave old paths behind. But, one only has 2 feet, and how many paths can you walk down at the same time anyway ?? Jon Michaels was very impressive in the opening slot thursday night. Rachel Bissex brought a band with her, and it was the first time i had ever seen her perform in other than a solo mode. I enjoyed some of stuff more with the band, and some less.. I guess i just like more rachel, less band in general.. Dogwood moon had their typical excellent energetic performance. David massengill was great, and jack hardy as his sideman certainly added to his show. Eliza Gilkyson had what i thought was the best performance i had ever seen her give at kerrville. The smash hit of the night for me was the Dry Branch fire squad. While i don't run out and make sure i catch every blusgrass performance that comes by, the fire squad is the exception. Their music is wonderful, but that's not why you go to their show. The leader of this zany group has one of the funniest schtick's i've ever heard. His takeoff's and sendup's of bluegrass, country folk, and general backwards peoples (sic) will have you holding your sides... 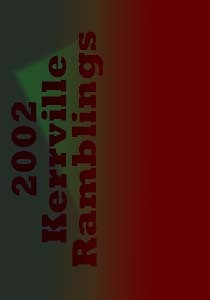 If you have access to the kerrville archives, make sure and catch their performance. After the show, it was on to the camps and seeing lots of old friends. Among the active camps we stopped at this night were singkerrnicity and nashville. One of the changes i've noticed in my activities over the past couple of years, is that as ellen and my camp has developed, we spend even less time wandering around, and more time close to home. "Camp Jews Don't Camp" is at the foot of the path up to chapel hill. Ellen spent much of wednesday, thursday, and friday fung-shuiing the camp until she got it "right". The friday performances i caught were johnsmith (he's coming down to play in south florida in November, don't miss him). Mike Williams (great stuff, we need to find out if he tours at all), and Caroline Aiken closed out the night with a great hour of blues/folk/rock and lots of heart..
With all the shopping, bread baking, and other "chores", i've also had to cut back on the ballad tree.. Ellen was able to get up there each day, and was very well received. She's making the kerrville experience her own now. Saturday, new folk was held at a packed threadgill theatre. The audience stretched way out beyond the capacity of the shaded areas. Everyone was overjoyed not to have to sit in the broiling sun. The performances as a group were exceptionally strong. Zoe Lewis in particular stood out, ad she broght down the house with her song "that thing". Zoe will also be coming down to south florida, but, if she's coming anywhere near your area, don't miss her. I think it was Saturday about 2:30 or 3 in the morning when a heavy storm moved through the area. People had advance warning, and had planned accordingly.. When you are camping in close proximity to other tents, and can hear the snoring, whispering, and other assorted activities, a heavy rainstorm brings wonderful privacy, and, based on the smiles of many campers in the morning, lots of folks had taken advantage of same..
Sunday's new folk is pretty much a blur, as ellen's participation moved me from uninvolved observer to committed stakeholder.. I tried to be calm enough for the two of us, since it was obvious ellen was having trouble maintaining her cool... She's performed her entire life, and certainly in front of bigger crowds, but, these are your peers, it's quite harrowing, and she was very nervous. Despite being disappointed that she was not one of the 6 winners, ellen realized that there are no losers in this competition. There are hundreds of people walking around the ranch who would give almost anything to have been selected as one of the 32 finalists. Sunday night, in the middle of all the new folk hoopla, were some excellent performances by The Joel Rafael Band, the waybakcs, Tish Hinohosa, and Staid Cleaves. Please were coming up to ellen and gary all night congratulating them on a great new folk performance, and expressing their disagreement with the judges decisions.. I think David Massengill said it best, during the announcement of the 6 winners: "We had to cut it down to only 6 winners, but there were 6 others who could have just as easily replaced any of the top 6". Monday was a very depressing day for me, as the realization hit home that i would be leaving the ranch early tuesday morning. As much as i wanted to come back for the middle weekend, there is just too much house stuff at home that just can't wait. As the day progressed, i went through phases of depression, and crying, and anger that i was leaving the ranch just as i was beginning to allow the ranch to change me in that magical way it does every year. Ellen & I started packing and arranging everything about 5PM, and i left her about 6:30 to head over to mainstage because i didn't want to miss the beginning of Jana Stanfield's performance. I caught the last 15 minutes of Hickory hill, good bluegrass. Little did i know that Kerrville magic was about to strike.. As excellent as the performances had been over the weekend, and fun as the campfires had been, nothing to date at this festival has been one of those blow-me-away moments. Jana changed that.. Whether it was partially my emotional state due to the upcoming departure or not, i spent most of the next hour crying. I was not alone.. Jana's performance has been moved from it's original location, but you can still hear "A Tiny Piece of Paradise" at www.itcanbethiswayalways.com I encourage all of you to support this great artist. The song comes from her "I'm not lost, I'm Exploring" album. Ellen & I completed the rest of our packing and goodbyeing during Carrie Newcomer's set, and then returned for Limpopo. When i first saw this group at kerrville many ears ago, there were fresh, high energy, and terrific. While still high energy, i think there are only 2 of the original 5 members, and the act has lost some of it's luster. But you couldn't tell that from the packed dance floor..
A heavy hailstorm cam through about 1AM. I noticed hail on the ground the size of golfballs. Luckily, we all survived without much damage. Around 2:30, Ellen & I said our last goodbyes, and drove away from the ranch. for years now, i've watched people leaving in the middle of the festival, and was sad for them, and saddened by the energy they were taking with them. It's much harder being on the leaving end of the equation. I feel out of place away from the Ranch during the festival. out of sorts.. and missing you all.. My wishes and thoughts are with you.